During the clear nights glass radiate its own heat very much into the cold sky (see the chart in IR spectrum), become colder than the dew point of exterior air and on its surface condens steam. In winter can the drops of water even freeze. The colder the exterior glass is, the more heat goes thru the IG (bigger gradient) and the more energy gets lost. 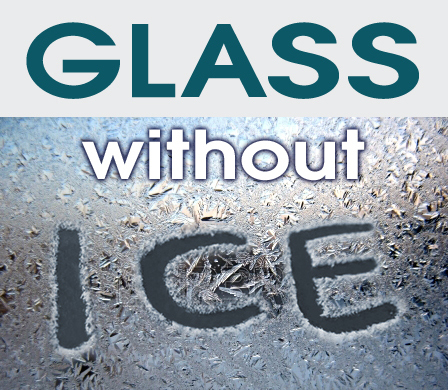 By simple double glazing is the heat flow bigger so the exterior glass freeze later and ice melt earlier. By tripple glazing is the heat transfer less and this is the reason why on exterior glass is wet or frozen surface untill Sun rise up and melts the ice and dry the glass. Reduction of far IR radiation of glass (wavelength longer than 2,5um) from 90% to only 3% encrease the total insulating capability of the insulation glass - exterior glass stays warmer and takes less heat from inside. Its exterior surface will not be covered with condens, because its temperature will not drop below the dew point of air. The polymer layer is hydrofobic - drain all watter immediatelly from the glass away (like teflon). Glass stays dry, no adiabatic coolling happens and even dirt does not adhere on the glass. Energy In s.r.o. sells polymerisation devices (incl. know-how and polymer), up to dimensions 3.2 x 2.3m.